Today, with little else to do, I ventured back to Felwood and found little competition killing Deadwoods and collecting their headdresses. 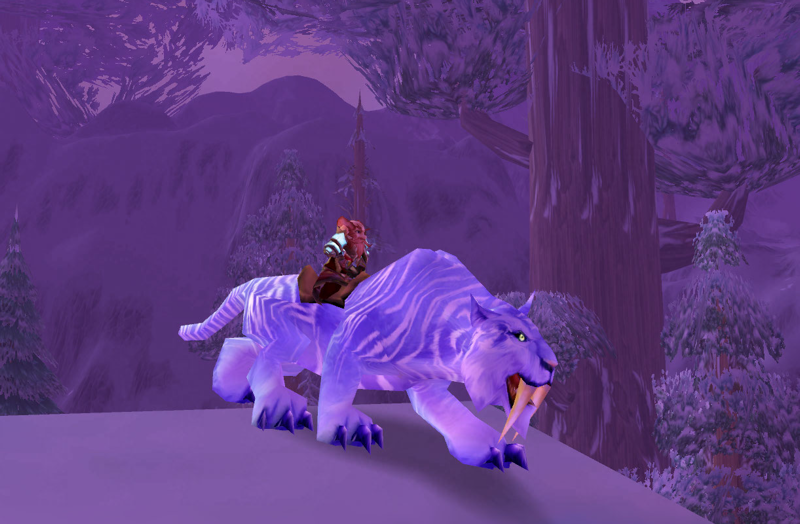 After getting a few, I went up to Salfa, turned them in and she bestowed upon me Exalted status amongst the Timbermaw. I went back inside their cave, talked to the chief, and he sent me to Winterfall Village. There I summoned a demon whom I was able to easily defeat, and upon talking to the chief again, he rewarded me with my very own ancestral Defender of the Timbermaw. 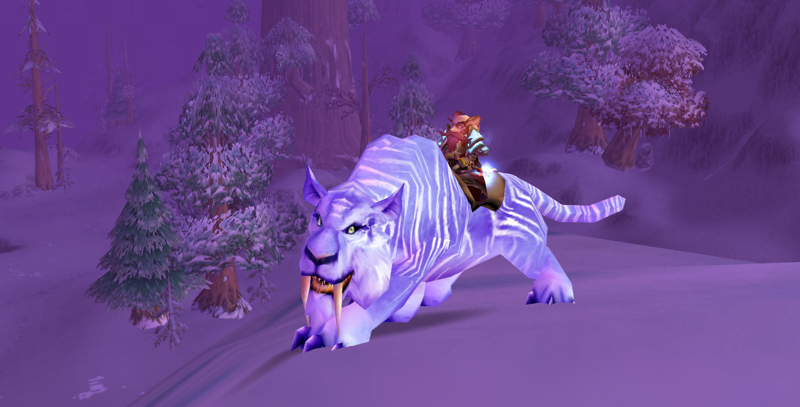 And with that, I am exalted with 21 factions and able to call forth a defender if I so choose to use the trinket. Today, after three days away, I returned to Mr. Pinchy ready to use my last wish. I summoned him from my bags and wished for a crawdad pet. Instead, he gave me a lame buff. And with that, Mr. Pinchy was gone. He was furious the first time I summoned him. Benevolent the second, and just buffed me the third. So the hunt for him in his pools begins again. And with the hunt, begins the Furious Crawdad count again. Last time it took about 150 crawdads before I found Mr. Pinchy. I'm already up to 30 this time around. We'll see how long it takes. This morning, I woke up early, killed a few Frostmourne Giants, gathered some Chillwind meats and headed up to Frostsaber Rock. 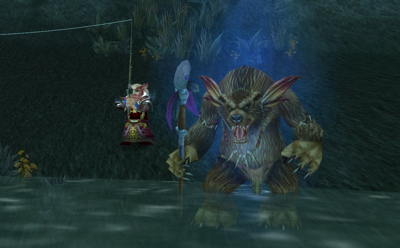 There, Rivern Frostwind greeted me once again, but this time with a sly smile on his face. He had seen me many times over the past few days as I complied with his repeated requests. This time though, once I had turned in the required items, he finally told me I had earned his respect. And with that, just on a seemingly random whim, he gave me the option to purchase one of his beloved Frostsabers. And so I reached into my pockets, fished out 80g, and handed it over. 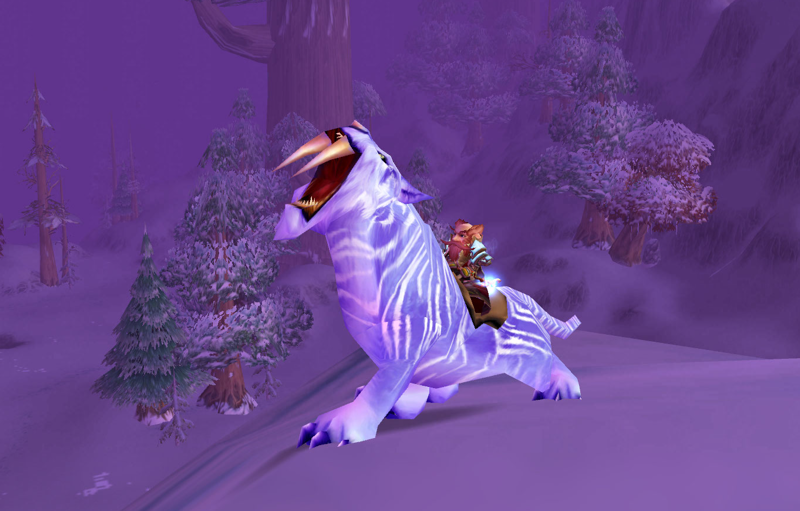 And with that, he handed me the Reins for a Winterspring Frostsaber. 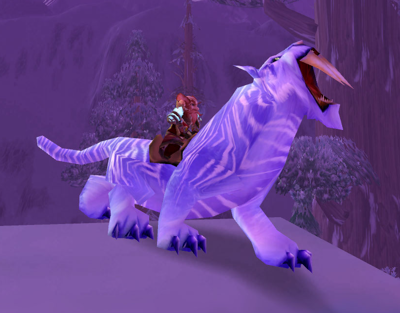 I mounted up, admired the Frostsaber atop the rock and then headed to Everlook, glad to be done with Rivern's quests. Now...about those Timbermaw.